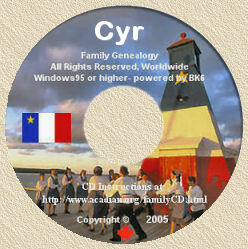 Acadian Genealogy Homepage; The Acadian Flag! For well over 100 years, Acadians from all over the world have been holding reunions originally called "Convention nationales acadiennes" and what has come to be known as... "Congrès Mondial Acadien". The first such meeting was held at Memramcook, New Brunswick in 1881, when an estimated five thousand (5,000) Acadians gathered to form 'La Societé Nationale l'Assumption'. Subsequent 'Convention nationales acadiennes' were held at Miscouche, Prince Edward Island in 1884; Church Point, Nova Scotia in 1890; Arichat, Nova Scotia in 1900, in addition to several others throughout the years. The most recent world 'Congrès' was held throughout the Province of New Brunswick in 1994 and was attended by an estimated one hundred thousand (100,000) Acadians! The next 'Congrès Mondial Acadien' is scheduled for Louisiana in 1999. And of course, the most significant 'Congrès' will be held in the year 2004, when all Acadians will celebrate the four hundred (400th) anniversary of the first landing of the Acadians, in Canada. It was at the 'Convention nationales acadiennes' held in Miscouche, Prince Edward Island in August 1884 that the Acadian National Flag was adopted. The tri-colour flag of France (blue, white and red) was chosen as the base flag. A yellow/gold star was placed in the upper part of the blue field, to give it the Acadian distinction. The yellow/gold star, our Lady of Assomption, represents the "Stella Maris" (Star of the Sea), seeks the protection of the Blessed Virgin Mary and indicates hope and the guiding light of the future. This is the emblem that represents our Acadian heritage, ancestors and the original lands of Acadia, established in Canada in the mid 1600's. The red section serves to remind us of the suffering and hardships of the past; the white section denotes purity of spirit and the peace of the present; and the blue section represents harmony with the sea and the sky. In an article which appeared in the August 28, 1884 issue of 'Le Moniteur Acadien', Father Richard explained that the choice of tri-colour was merely a symbol representing Acadian descendants..."pour nous, Acadiens, ce drapeau nous dit simplement que nous sommes français et que la France est notre mère-patrie." 1. Hand-made Acadian flags are available from by Kate Albert, 258 Gagnon Road, Madawaska, ME 04756 (207) 728-4311 in two different sizes. The 2' x 3' costs $25.00 and the 3' x 5' is $45.00. Each flag has two 1/2" grommets for hanging and since all flags are constructed of 100% nylon, they are ideal for hanging outdoor. Please add $3.50 shipping/handling (for the first flag) and $1.00 for each additional flags. Personal cheques or Money Orders only, are accepted. According to my good friend Geraldine Chasse of the Acadian Cultural Exchange, "given that Kate is a real artist at quilting and sewing, they are worth every penny!" 2. You can source the "Louisiana-Acadian" and the "Canadian-Acadian" flags from Andrea Perez at Breaux Bridge Trading Co., 202 Guilbeau Street, Breaux Bridge, LA 70517. Their flags are 100% polyester and, according to Andrea... "fly so well in the breeze"! Breaux Bridge Trading Co. also stock (or can obtain) most other flags. The flags are 3' X 5' and cost $10.00 each (money order or cashier's check), plus $4.00 shipping/handling in USA. Contact Andrea by e-mail for exact cost of shipping/handling for multiple flags, or shipments outside the USA. 3. Another good source for Acadian Flags, is 'La Librarie Acadienne' at the University of Moncton, as well as at the main Shopping Center of Moncton (actually located in Dieppe, N.B.). The following appeared in the June 4, 2000 issue of the "Louisiana Ancestors"
In the second half of the 19th century we find a rebirth in Acadian conciousness with the foundation of institutions that have allowed Cajuns to insure their place to the sun. In 1864 the first Acadian college was founded and the first Acadian newspaper in 1867.
left France for the New World during a great devotion to Mary. The star, represents the star that will guide the Acadians through the storms and reefs of the coming years and the color yellow, the papal color, was chosen represents the strong attachment to the Holy Mother Church. The choice of the flag was influenced by the great patriotic Cajun, the abbot Marcel-François Richard. Born at Kent, New-Brunswick in 1847, who was a great promoter of the education in the French language. he was also instrumental in choosing the national feast day and the national Cajun hymn (Ave Maris Stella). The original Cajun flag was made by Mlle Marie Babineau St. Kent. In reality, this flag consisted of a tricolor commercial manufacture French flag on which was added the star made by Mlle Babineau. The flag measures 6 x 9 feet (1,83 x 2,75 m) and is made wool. The flag has been in possession of many people over the years, and finally transferred to the Acadian Museum of the University of Moncton in 1969, where it is now on permanent exhibition.